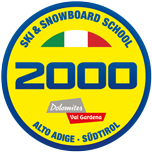 It doesn't matter whether you are an absolute beginner, an advanced or almost professional skier, if you begin all over again, you changed over from another sport or look for a refreshing course, if you are a child, a teenager or an adult: All passionate skiers are welcome in our Ski School 2000. A young team of selected ski & snowboard instructors is waiting for you and looks forward to teaching you the best skiing technique with cheerfulness and passion. They all apply modern teaching techniques and transmit their knowledge with professionalism, experience, joy and energy. If you would like to learn more about lessons and prices please click here. Get ready for a unique adventure: the Sella Ronda - a skiing day all around the Sella Massive. If you prefer, you can be accompanied by an instructor of the Ski School 2000.